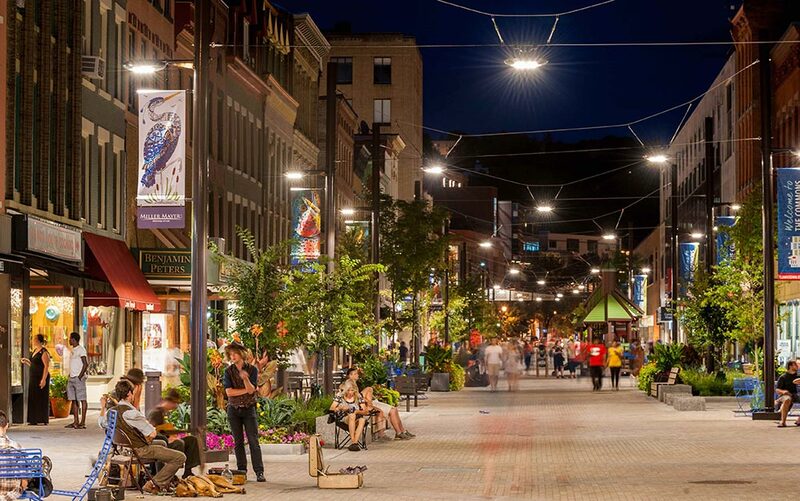 Ronstan Tensile Architecture recently completed a catenary lighting supply job for the Ithaca Commons in Ithaca New York where we supplied a combination of 3/8” diameter 316 SS ACS1-SS-12 and ACS2-SS-12 Cable Assemblies to Hanes Supply for the lighting installation. Ithaca Commons is a mixed use pedestrian mall in Ithaca’s downtown. The redesign of the Commons was intended to improve the retail environment and create a community gathering space in the vibrant college town. Precisely designed lighting was one key to creating that welcome environment to shoppers, employees, and visitors. Matt Berrelli, the Ronstan sales representative for this job commented that “suspended or catenary lighting may look like an afterthought to some people, but it is so specifically designed in collaboration with the architect, to remove obtrusive lighting structural elements, and create inviting community spaces.” According to Sasaki, the architects of the Commons redesign, “The $15.3 million makeover of the Commons, which had not changed much in the 40 years since creation, is both emblematic of and a stimulus for the rapidly changing face of downtown Ithaca”. For the design of the stainless steel catenary wire lighting system, the structural cables are arranged with upper and lower cables approximately 3 to 4 feet apart. The upper cable supports the weight of the 30-pound lights. The lower cable is there to provide stability to the light and to minimize swaying caused by winds. There are additional vertical cable connections made with adjustable swage toggles, between the upper and lower cables to provide the tension required for the suspended system. Ronstan Tensile Architecture provided the catenary lighting structural support materials to Hanes Supply of Buffalo, NY. The owner of the project is the City of Ithaca, NY. Installation and Electrical Contractor was Power & Construction, Scottsville, NY. Architect is Sasaki Associates (Watertown, MA).